Need another casual game that is simple in concept and takes little attention while still posing a challenge? You know, something to say, occupy your hands and wandering mind while you’re having your what have now become daily hour-long phone calls with your mother (love ya mom)? I came across one such situation and found another wonderful app to fill my time and entertain my fingers. I’m talking about Tricky Tracing. No, this is not some kind of children’s coloring game as the name might make you assume (but here’s one if you’re interested), although the game play is simple enough for all ages. This puzzle game comes from an easy enough concept, basically it is a maze game. You are attempting to draw a line from a “start” point to an “end” point without hitting any walls. In later levels you must collect several objects throughout the map before arriving at the end point. 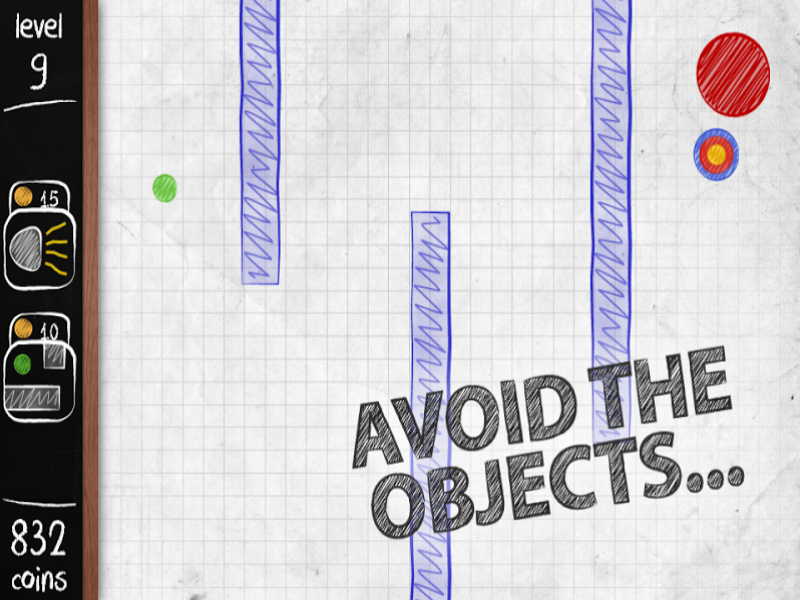 Many of the levels have only a few objects obstructing the path and levels can be completed in a few seconds. So where does the challenge come from? Once you place your finger on the starting location all of the walls that were guiding your path now vanish. Vanish probably isn’t the right word. Technically the obstacles are still there, but they are now invisible. You are now blindly navigating through what seems to be a blank slate trying to connect the start to the finish. To help you along the way the developers (Itch Mania) have graciously given you a few tools. For starters, the maps are on what appears to be a sheet of grid paper. So even though the objects disappear upon movement you can focus on certain spots to avoid. Also, there is a “radar” which gets smaller and beeps as you come closer to a collision. Between the two I found I was able to find my way through most of the puzzles in just a couple tries if I moved as a slow pace. There are also a few power ups that you can buy with in-game coins, which you earn through completing levels (or can buy in micro transactions). There is one that works like a candle and reveals the area surrounding your marker for a limited time. The other power up reveals the entire map once again, but does not allow movement during the moment of clarity. To be honest, I only ever used them both once and that was only because I was curious what they did. This game is FREE and appears to only be available for Android devices at the time of writing this article. If you have a moment to look it up, give it a go. But be warned, this is the type of game that can be stressful, and I could see causing those easily frustrated to throw their phone across the room.